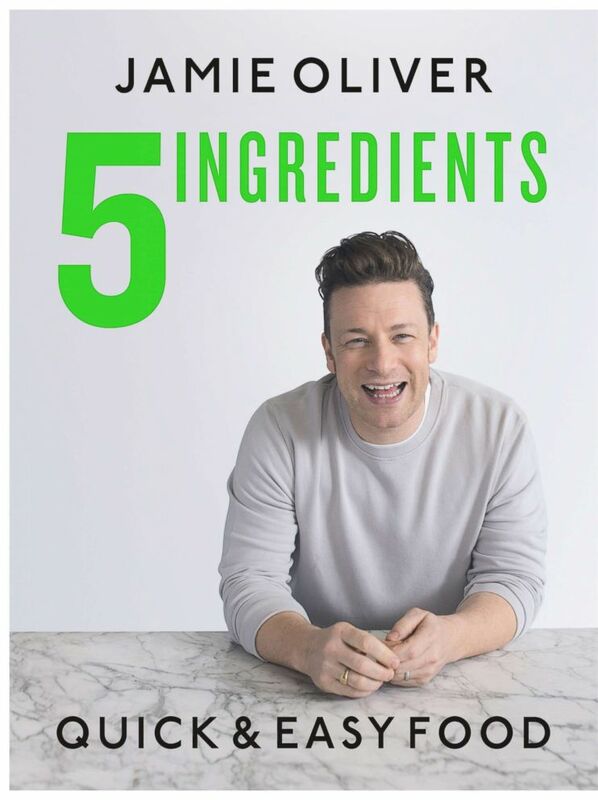 Chef Jamie Oliver's new cookbook highlights simple dishes that can be prepared with five ingredients. Oliver told "GMA" he focuses on "keeping it short and keeping the flavor big" in his recipes for this cookbook. "That has been the phenomenon." Oliver shared three recipes from "5 Ingredients Quick & Easy Food" including a steak stir fry, pasta carbonara and garlic chicken. Check out the full recipes below and make them in your own kitchen! 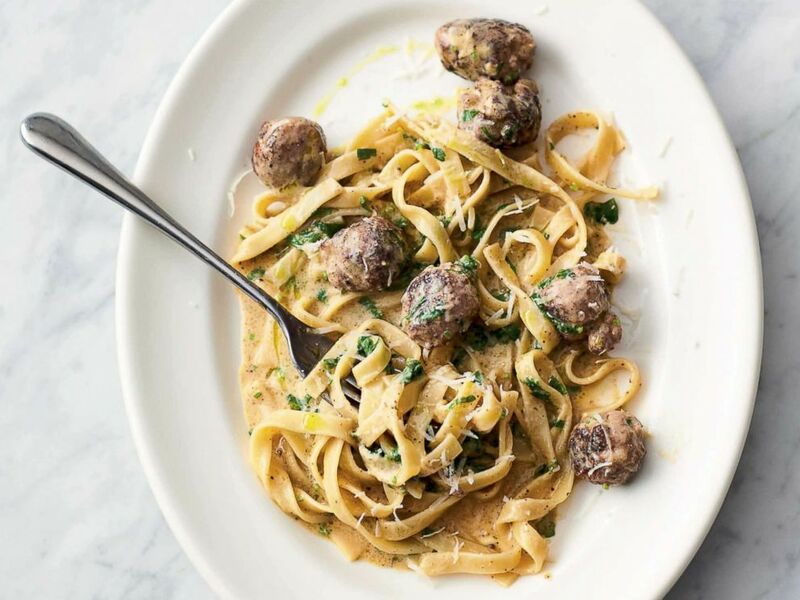 Jamie Oliver's easy sausage carbonara from his new cookbook "5 Ingredients Quick & Easy Food." Cook the pasta in a pan of boiling salted water according to the package instructions, then drain, reserving a cupful of cooking water. Meanwhile, squeeze the sausage meat out of the skins, then with wet hands, quickly shape into 18 even-sized balls. Roll and coat them in black pepper, then cook in a non-stick frying pan on medium heat with half a tablespoon of olive oil until golden and cooked through, tossing regularly, then turn the heat off. Toss the drained pasta into the sausage pan, pour in the egg mixture and toss for a minute off the heat (the egg will gently cook in the residual heat). Loosen with a good splash of reserved cooking water, season to perfection with sea salt and pepper and finely grate the remaining Parmesan. Jamie Oliver's quick steak stir-fry from his new cookbook "5 Ingredients Quick & Easy Food." Peel and very finely slice the garlic and ginger. Put into a large cold non-stick frying pan with 1 tablespoon of olive oil, and place on a medium heat, stirring regularly. Once crisp and lightly golden, scoop out of the pan and put aside, leaving the garlicky oil behind. Line up the asparagus spears and trim off the woody ends, then add the spears to the hot pan. 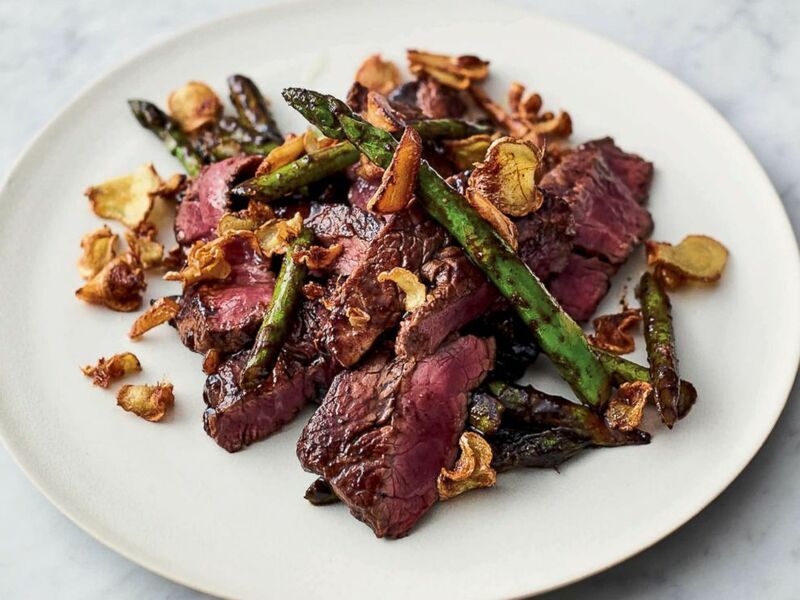 Season the steaks with sea salt and black pepper, add alongside the asparagus, and turn the heat up to high. Cook for just three minutes, turning everything regularly. Toss in the black bean sauce and one tablespoon of red wine vinegar for one minute, this will give you medium-rare steaks. Alternatively, cook to your liking. Slice the steaks, dish up, then scatter over the crispy garlic and ginger. 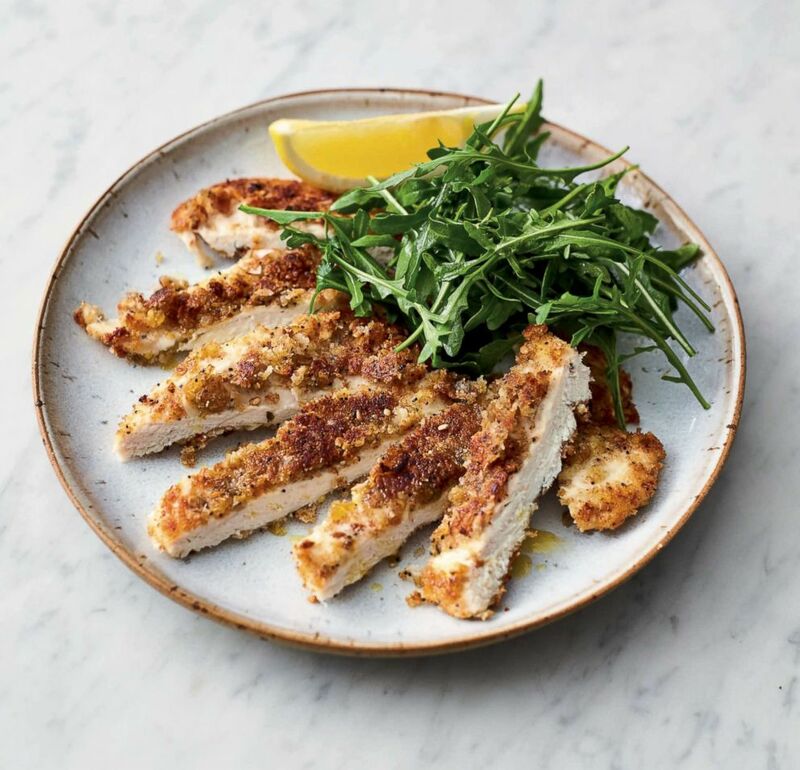 Jamie Oliver's crispy garlicky chicken from his new cookbook "5 Ingredients Quick & Easy Food."